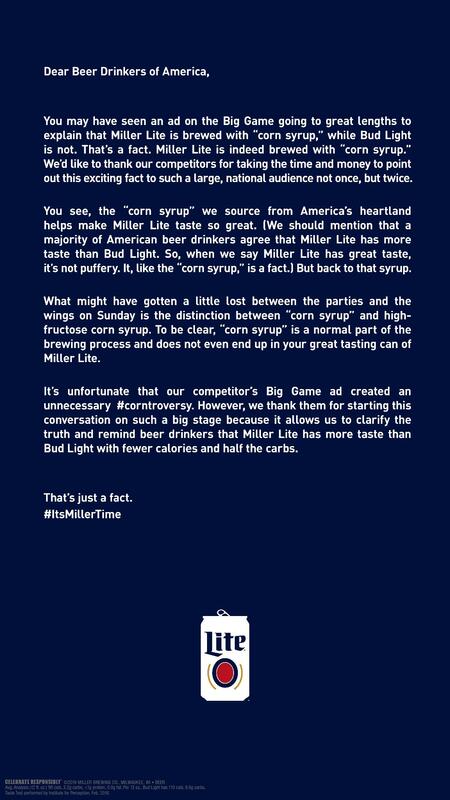 Published Feb. 5, 2019 at 12:15 p.m.
During the Super Bowl, Anheuser-Busch ran a 60-second ad shaming Miller Lite and Coors Light for using corn syrup to brew their beers. However, dietitians were quick to say the sweetener isn't particularly unhealthy when used in the fermentation process. To further the point that "corn syrup" and "high fructose corn syrup" are not the same thing, MillerCoors took out an ad in The New York Times addressing beer drinkers and, inadvertently, their macro beer rivals.